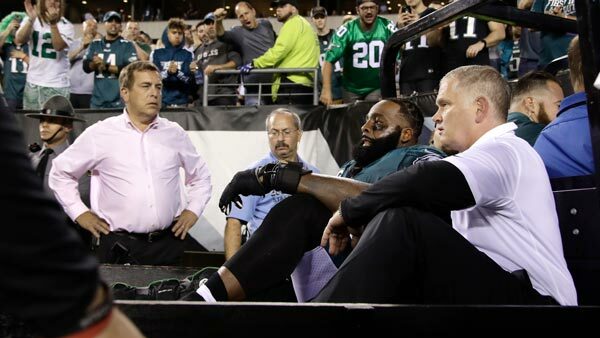 PHILADELPHIA -- Philadelphia Eagles left tackle Jason Peters and linebacker Jordan Hicks are out for the season after suffering injuries during Monday night's game against the Washington Redskins. Head Coach Doug Pederson made the announcement during a Tuesday afternoon press conference. Peters tore his MCL and ACL when a Washington Redskins defender rolled into him and forced him out on a cart. Peters is a three-time All-Pro selection and has anchored Philadelphia's line for a decade. Washington lineman Ziggy Hood rolled into Peters, and his right leg immediately twisted in an awkward manner. Peters went down and trainers ran onto the field. Peters' leg was placed in an air cast and the crowd chanted his name as he was placed in the cart. The Eagles surrounded the cart and slapped hands with Peters before he left the field. Philadelphia Eagles players gather on the field as teammate Jason Peters is put on a cart and taken off the field. Halapoulivaati Vaitai replaced Peters at left tackle for the Eagles. Linebacker Jordan Hicks suffered a ruptured Achilles tendon on the first series. Hicks left the stadium on crutches. On Twitter, Hicks wrote to fans, "Thanks for all the thoughts and prayers! Better believe the comeback is going to be real. Psalm 28:7 #FlyEagelsFly"